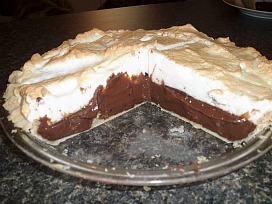 I learned how to make a chocolate pie recipe many years ago. It was my first meringue pie recipe and it was very creamy and delicious. Believe me that is only one of many! There are pies made with chocolate ice cream and other flavors of ice cream with chocolate toppings. We have chocolate crusted pies with various fillings, pies made with chocolate candy bars, layered pies with different kinds of chocolate and there are chocolate cheesecake pies. As you can see the list is endless; your imagination can create a new chocolate pie recipe every day. 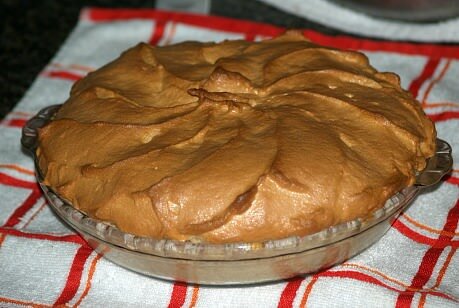 When I learned how to make my chocolate pie recipe it was a favorite of my brother-in-law's. We always kid about women loving chocolate, but Paul was the biggest chocoholic that I ever knew. 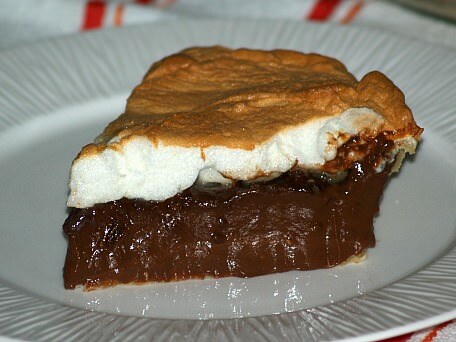 This pie has the best tasting and smoothest chocolate pudding recipe used as the pie filling. 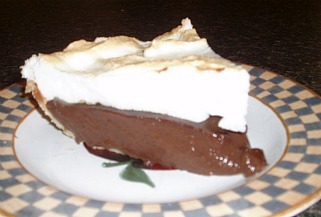 Whenever possible, I always tried to make this chocolate meringue pie for him. Mix cocoa, sugar, cornstarch and salt in a heavy saucepan. Cook over medium heat, stirring constantly, until the mixture thickens and boil 1 minute longer. Remove from heat and pour half of the hot mixture into the beaten egg yolks as you beat in. Pour this egg mixture back into the saucepan with the remaining milk mixture and return to the heat. Boil for 1 minute longer as you stir. Remove from the heat; add the butter and vanilla and stir in. Pour into a baked pie shell and add meringue. When you learn how to make chocolate pie recipes try this one made with German chocolate. Melt chocolate with the butter over low heat, stirring until blended. Remove from heat and gradually blend in the milk. Combine in bowl the sugar, cornstarch and salt; mix thoroughly. Gradually blend in the chocolate mixture. Combine the coconut and pecans and sprinkle over the filling. Bake for 1 hour or until the pie is puffed and brown. For the last 20 minutes of baking, cover pie with a piece of aluminum foil. Let set until cold before cutting. Although this chocolate pie recipe has only a little chocolate from the candy bars, it makes a delicious dessert; one special enough for the most special company. Beat egg whites until very stiff; blend in sugar and vanilla. Combine crushed crackers with pecans; fold mixture into beaten egg whites. Spread mixture into well greased 9 inch pie plate (bottom and sides). Bake 25 to 30 minutes; cool to room temperature. Fill shell with softened ice cream; crumble candy bars and sprinkle over top and freeze until firm. Combine in top of double boiler the candy bars, marshmallows, milk, vanilla and almond extract. Stir until chocolate and marshmallows are melted; chill. Mix wafer crumbs and butter; press in bottom and on sides of pie plate. Beat whipping cream until stiff; fold into cooled chocolate mixture and spread into prepared pie plate. Chill until firm and garnish with chocolate curls. Beat egg whites and salt until soft peaks form; gradually add sugar beating until stiff peaks. Fold in vanilla, chocolate wafer crumbs and walnuts; spread evenly in a 9 inch butter pie plate. Bake 30 to 35 minutes until set; cool thoroughly. Whip cream until stiff; spread over cool pie; pipe around edges to decorate. Sprinkle with chocolate jimmies or curls; refrigerate for 3 to 4 hours before serving. Sprinkle the pecans and chocolate chips in the pie shell. Combine and mix in a medium bowl the corn syrup, sugar and eggs; mix in the melted butter. Pour egg mixture evenly into pie shell; bake about 1 hour until firm. To serve top with dollops of whipped cream.